~Beauty In the Storm ~: How Much Time Do You Spend, With Your Own Soul? 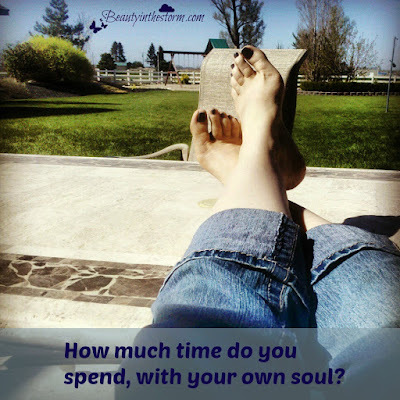 How Much Time Do You Spend, With Your Own Soul? How much time do you spend with your own soul? How much time do you spend pursuing the things you love? Pondering the thoughts on your mind? Feeling the issues that weigh on your heart? How much time, do you spend with your own soul? We can’t gain focus in life, clarity, perspective, or truly know what we think and feel…. If we are too busy DOING life, and not devoting enough time to funneling out all the noises and sounds of it, so we can hear ourselves. And it can be so easy to forget to listen. To forget to know the sound of the beating of our own heart. Doing is often easier than “being.” “Being” with ourselves. “Being” FOR ourselves. BEING ourselves. In our authentic skin. We fear that our thoughts might be rejected and our hearts might be neglected. But sometimes you have to fight for yourself. Fight for the right to hear yourself. To listen to yourself. To KNOW yourself. I wouldn’t want to do life not knowing who I was. I don’t want to forget who I’ve been, and who I’m becoming. And I want to CHOOSE those things for myself – not let them be dictated by someone else. So I need to spend time with my own soul. Learn to tend to it. Let it speak to me, direct me, and fuel who I am. Each day. Step aside. Go to a quiet space. And BE. Close your eyes, and let your heart and soul do the talking while you just listen. While you listen and learn about yourself. For no one should be an expert on you – except YOU.